The praying mantis is an easy insect to recognize. They have a long narrow body that is stretched in the middle where the legs attach. They have a small triangular head with two large compound eyes. But most of all, they have those impressive, oversized front legs held upright in front of the face. There are more than 1500 different kinds of mantids in the world. Most of these are tropical insects, and only about 20 kinds occur in the United States. Unfortunately, only 5 species are common in the US and only 2 are routinely found in Iowa. The two kinds of mantids in Iowa are the Chinese mantis and the Carolina mantis. Both are large, long, slender and slow. The larger, Chinese mantis may have a body length (without front legs) of 3 to 4.25 inches. The Carolina mantis is 1.75 to 2.5 inches in length. The body is tannish-brown or green with the narrow front wings marked with a green line along the front edge. Praying mantids feed only on living prey such as moths, crickets, grasshoppers and flies and could be beneficial biological controls in the garden. However, they do not discriminate between beneficial and harmful insects and will eat their siblings, other beneficial insects, butterflies and pollinators such as bees. Overall their impact in the garden and landscape is probably negligible (though they are fun to watch!). 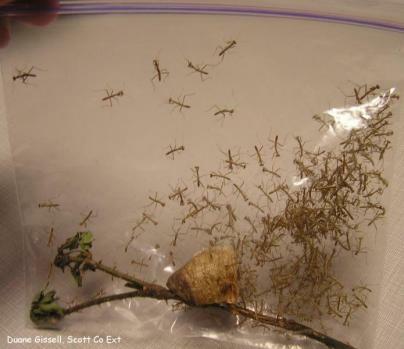 The natural life cycle of praying mantids is to eat and grow through the summer and then mate and lay eggs in a stiff foamy case in the fall. Adults die of old age or freezing, whichever comes first and the eggs persist through the winter (if the weather is mild) and repeat the cycle the following summer. There is only one generation per year. 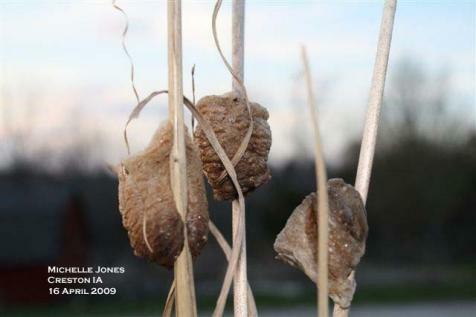 If you have or find a mantid egg case the recommended action is to keep it at winter temperatures in a box or jar in an unheated garage or porch. Do not keep it indoors or the eggs may hatch in January or February when there is no chance to release them outdoors. Bring the egg case in and begin watching for nymph emergence in about mid-May. Unfortunately, some eggs will never hatch. If the eggs do hatch it becomes a challenge to handle the sudden population explosion of tiny nymphs. They will be all right together for a day or two but then they will begin to eat each other. To maximize the number of survivors, nymphs need to be moved to separate cages, or more practically, scattered around the outdoor environment after a day of entertaining observation. Raising nymphs through to adult stage in captivity is incredibly difficult.